With the focus on Wimbledon this week and next, "Andy" Murray renews his quest to become the first Brit to win the men's singles title since Fred Perry did it back in 1936. This has been a common theme over the last few years as Brits rally support for their favorite son. However, when the greatest golfers in the world squared off for The 2013 United States Open Championship earlier this month, June 13–16, at the East Course of the historic Merion Golf Club in Ardmore, Pennsylvania, few were wondering if this would be the year an Englishman finally took the top prize. And fewer were cognizant of the fact that a Brit hadn't won the title since Tony Jacklin performed the feat back in 1970. 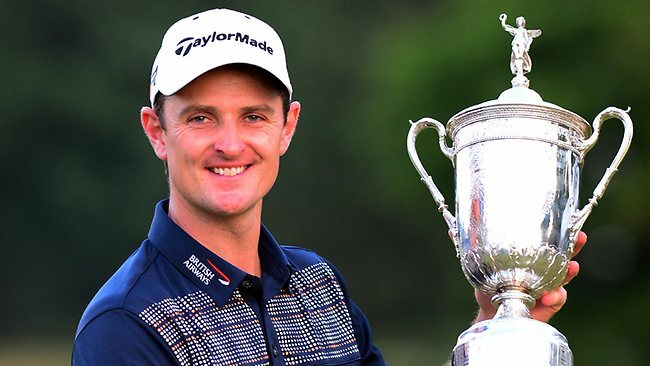 Justin Rose posted a respectable one over par 71 for round 1, respectable, but still four strokes behind the leader with 15 competitors ahead of him. Actually, Luke Donald, another Brit, who had shot a two under 68 and was tied for second one stroke behind Phil Mickelson would have seemed a better bet to bring the crown back to England. Rose's second round 69 on the treacherous course brought him back to even par and suddenly he was tied for second place along with Luke Donald and Steve Stricker, one stroke behind Mickelson and Billy Horschel. His one over 71 for round 3 dropped him a couple slots to a tie for 5th. Still, he was only two strokes behind and in the hunt. The final round proved to be a test of skill and nerve. Phil Mickelson who had had a share of the lead for the first three rounds started off poorly, three-putting the third and fifth holes for double bogeys. However, he took back the lead with an eagle on the 10th. Justin Rose responded with birdies on the 12th and 13th. A bogey by Mickelson on the 13th gave Rose the lead. Through 16 holes, Rose had five birdies and five bogeys and a one-shot lead over Mickelson. He managed par on the challenging final two holes, finishing with an even-par 70 for a 281 (+1) overall. Meanwhile, Mickelson narrowly missed a birdie putt on the 16th that would have tied Rose and failed to birdie either of the final two holes. His +3 overall dropped him into a tie with Jason Day for second place. For Rose, it was his first major title. He completed the tournament without any double bogeys. On his win, Rose commented "It feels fantastic. I committed myself to the process this week. I committed myself to putting a strategy in place that I hoped would work in five-to-10 years in delivering major championships ... it's a moment where you can look back and think childhood dreams have come true." Seeing as you are one of the world's leading authorities on matters of psychology and sports, I was wondering if you could help me with this problem I have. Well, the problem's not mine, exactly. It's not Doc's or Lefty's either. It's the sole property of another member of our foursome, my brother-in-law Pete, or as we call him behind his back, re-Pete. We call him that because of the zillion annoying and time-consuming motions he goes through each and every time he steps up to a golf ball. First thing he does after club selection, an agonizing process in and of itself, is set his grip. Defying description is the unique way he wraps his stubby fingers around the shaft, squeezes, then twists them inward, inward, inward, about 27 times. Lefty calls this maneuver "screwin' the cue," because it resembles the way a pool player would screw a two-piece cue together. I call it "screwin' your friends," because of the effect it has on our playing. Eventually, after 95 to 100 seconds, Pete will shoot us a smile, meaning he's satisfied with his hold. We don't get excited, though, not about phase one of the gripping ceremony. That's what I said-phase one. Phase two comes later, after he steps up to the ball, adjusts his feet, flexes his knees, one-two-three, and fixes the target with a long, hard stare. Then, after 11 to 13 seconds goes by, he starts shaking his head "no." How we dread that moment knowing, next, he'll step back from the ball, let his grip unravel, and start screwing the cue all over again. Never fails! Ace, no lie, I'm not the fastest guy off the blocks, but I can usually get a shot off in 15 to 20 seconds. By the time Pete drops the lid on phase two gripping, three minutes have crawled by. Lefty calls Pete's next move "the tap waggle wiggle." That hardly describes it! With those gnarly, sweaty little hands finally locked in place, Pete again steps up to the ball and, with the head of his club, taps the ground behind it three times, tap, tap, tap, then in front, tap, tap, tap, then in back, again. Next, he waves his club, slowly and unrhythmically, over the ball-waggle, waggle, wag. Then he shifts his hips, left-right-left, takes a long, deep breath, and checks his alignment. We dare not speak, sneeze, or pass wind at this juncture for fear of disrupting Pete's concentration. That would force him back to phase one cue screwing. Tap tap tap, tap tap tap, tap tap tap; waggle waggle wag, waggle waggle wag; wiggle wiggle wig, wiggle wig. He re-Petes that little ditty no less than 23 nerve-wracking times, adjusting his aim a little left, a little right, between verses, until he finally feels everything is just right. Then, and only then, will he take one of his rickety swipes at the ball. Elapsed time: seven minutes. Frankly, Ace, golf has ceased to be a joy for me, Doc, and Lefty. Fact is, it's pure torture. On a good day, it takes us seven hours to play nine holes. Tell us, please, what can we do? It appears to me that Re-Pete's ritualistic behavior is symptomatic of Obsessive-Compulsive Disorder (OCD), known also as Hand Washing Syndrome. Unfortunately, every time Pete strikes the ball, he reinforces each of the "zillion" undesirable behaviors that preceded it, thereby assuring that he will repeat the sequence, ad infinitum. Consequently, if you really want to put the fun back in your game, and at the same time perform a service for golfers everywhere, I suggest you break his arms and legs.